Andúnië - As the kings of Númenor began to distance themselves from the Eldar of Middle Earth, a rift developed among the Númenóreans between those turning against the Elves and those who remained loyal to them. 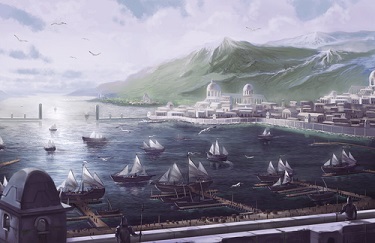 The "Elf-friendly" Númenóreans were known as the Faithful (as they named themselves) and many withdrew from the capital of Amenelos in the central part of the island, and relocated to the older city of Andúnië along the west coast. From that point, Númenor was essentially divided into two peoples. Andúnië means "sunset" as it was the last city on the island to see the sun go down in the evening.